Songwriting icon and legendary performer “Whisperin’ Bill” Anderson released his new autobiography Whisperin’ Bill Anderson: An Unprecedented Life In Country Music September 1 and within two weeks, the entire first printing was sold out! A rush shipment just arrived and more copies are available now. In addition, listeners can sit back and enjoy a NEW audio book narrated by Bill Anderson. The audio book bundle also includes a Bonus CD featuring 10 never-before released self-penned acoustic recordings by Anderson, including smash hits like “Whiskey Lullaby” (Brad Paisley/Alison Krauss), “Give It Away” (George Strait), “City Lights” (Ray Price) and seven more (track listing below). The book is a 360-page representation of Anderson’s journey published by University of Georgia Press featuring respected music journalist and Grammy-nominated music producer Peter Cooper as a contributing writer. 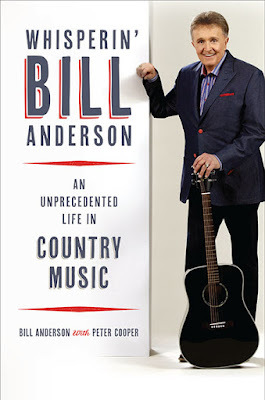 It includes rare, never-before-seen photos and eye-opening personal stories from Anderson’s nearly eighty years of living – from early days of radio broadcasting in Georgia, to standing alongside the greatest country music stars in the world onstage at the Grand Ole Opry, to being named BMI’s first ICON Award winner in the country music genre. Anderson will be signing copies of the book after his Grand Ole Opry performance on October 11, as well as at the Southern Festival of Books on October 16 and the County Music Hall of Fame on Saturday, October 22, where he will be participating in a special Songwriting Session which be be live streamed at countrymusichalloffame.org/streaming. For those unable to attend, Whisperin’ Bill Anderson: An Unprecedented Life In Country Music jacketed cloth edition will be available for $29.95 at Barnes & Noble, Books-A-Million, various independent book stores, and online at www.BillAnderson.com and Amazon.com.